Don't fall at the first hurdle. If you're in the process of making a strategically important hire to realise the next stage of your growth strategy, it's time to think seriously about how best to structure your search in order to maximise your chances of success. 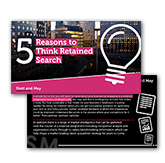 This handy guide entitled: '5 Reasons to Think Retained Search' is designed to help hiring managers understand the pros and cons of opting for a retained search model over traditional contingency recruitment.